I thought this might be a good way to introduce us and get you familiar with what we do. Sure. What's one thing that would improve our website to make it better for you? Thanks for your feedback! We are always looking for ways to improve the website and provide a better experience for our users. Boomworks is a design practice built around rapid invention. We work with you to create the most engaging experiences for your customers. Find out how we think, or jump right in. Boomworks combines unequalled expertise in user centred design with advanced technology to deliver solutions that make a difference. Boomworks are able to identify key journeys within complex ecosystems, design the best experience across all those touchpoints and deliver solutions utilising the latest technologies. Would you like to learn more about us and our work? The ubiquity of all technology shares a common component - us. Businesses need to rapidly deliver contextual experiences across an evolving range of platforms. How do organisations move quickly enough to respond to changes in customer behaviour? Customer experience is critical, but how does that get implemented in line with all business strategies in place to retain and grow your market? Find out how Boomworks solve these problems. When you have a team of gamers, coders, musicians, sculptors, cycling nuts, problem solvers, rule breakers and everything in between, exciting things are bound to happen. At Boomworks we use our scale to our advantage. We have a deep playbook that informs our method but it doesn't anchor us against change. Our broad technology skills enable rapid prototyping to validate concepts in context early in the process allowing for learning and iteration. Want to know what this great team does? Can I see some work examples? Enterprise scale innovation at start up speed. A history of being in a state of continual testing is fundamental to our process - learn and iterate. Making smaller iterations more often yields incremental insights faster. Dedicated teams mean streamlined communication within project teams and stakeholder groups. We organize into small teams, work in sprints to quickly conceive and test multiple design ideas as functional prototypes, refine the concept and deliver the most intelligent solution. Want to know more about the Boomworks team? A lot has changed in the past 13 years, but our focus on user centred design has not. From our base in Sydney we deliver solutions for clients from around the globe. Like to learn more about our work? We've always worked with large, highly visible businesses and state and federal government departments. While they all share the challenge of complex problems and interesting challenges, the other thing they have in common is a commitment to solve customers problems and create engaging solutions. Like to see our work in action? Whether it's online experience design, digital concept development, or our conversational intelligence platform - Boomworks Experience Intelligence is at the core. Boomworks was founded as a user centred design studio over 13 years ago to bring intelligent design solutions to life. We have a refined set of processes formed around complimentary services that enable the uncovering of behavioural insights and conceiving, iterating and creating connected experiences that can be delivered through an increasing range of devices and platforms. Want to understand our tools of the trade? We assist organisations to uncover business opportunities and customer behaviours to inform strategic decisions. We design conversational experiences for deployment in-house, or for development on our custom conversational platform BBX. Our lean canvas inspired rapid invention process is designed to highlight new ideas & proof of concept prototypes. Discover a wide digital skill-set to support your team or project from initial UX research and design, through creative concepts, testing and iteration to developed solution. Want to understand how we put that in action? Our behavioural research, iterative design and prototyping process ensures we conceive great ideas and make them real. Context and convenience define our connected experiences. 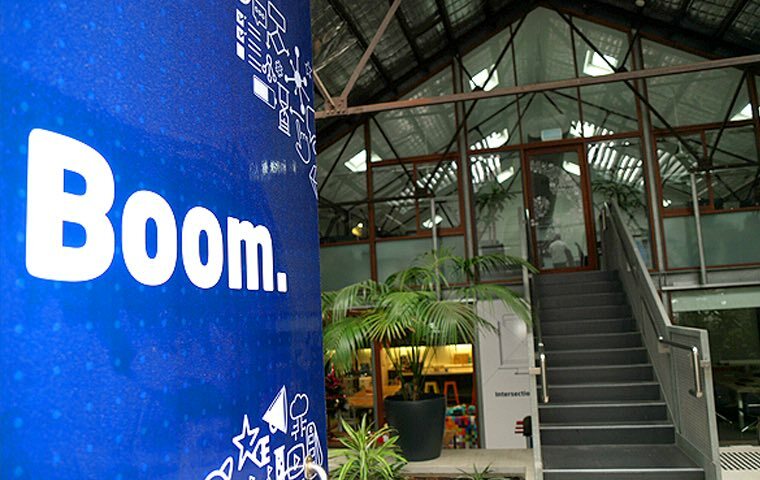 At Boomworks we believe in creating amazing digital journeys. The digital journey can define a relationship with businesses or brands. How seamless that journey is depends entirely on the ability of the intelligence of the technology to engage and support a user from end to end. Every stop on a customer journey will be impacted by how design and technology combine to deliver your solution. Customers will interact with your business with whichever device is appropriate for the task at hand, or just happens to be closest. They expect their interactions with these devices to be seamless, intuitive, doesn't require them to think too hard about it and won't get in the way of getting their task done. Boomworks understands that sometimes how you do things is just as important as what you do. Some of our experiments escaped from the lab. There's no complacency with learning and finding new ways to prototype and validate ideas through testing with real users. Whether it's AR, VR, AI or mixed reality, we understand the importance of developing products that are scalable and take advantage of where your users will be in the future. Do you do AR, VR or mixed reality? Boomworks have developed BBX, not just another off the shelf Chatbot. BBX can be tuned specifically for your needs, learning about your industry, while always delivering a great customer experience reflecting your brand and personality. BBX is where your customers are. From a range of messaging apps to web to mobile to Alexa and Google Home - customers are interacting with businesses on a growing range of platforms and devices. Enabling the power of natural language conversational interfaces ensures your business is ready to talk to your customers - when and where they want with conversational intelligence. Boomworks are constantly pushing ourselves to create amazing digital relationships between businesses and their customers - even altering reality. With AR we are able to create a broad range of rich applications featuring chat and voice led interfaces for iOS using ARKit and with ARCore for Android, as well as augmented reality glasses and headsets. These voice-led interfaces also extend to VR and give your users an amazing sense of immersion and emotional connection with your brand on a range of headsets, using Unity or Unreal. The current website has over 65,000+ pages; and the client had a desire to improve the information architecture, navigation and general usability. An imminent migration to a new CMS, which called for the creation of a component-based library. The museum have an objective to shift public perceptions towards nature, indigenous cultures and science. We started by sorting and prioritisng the content types that reside in each page. This was done with key stakeholders and a dedicated content strategist. Design checkins were done with key stakeholders at least once a day, plus in-team collaboration sessions. We created re-useable components, and used these components as blocks to create templates from. An intial round of guerilla testing to focus on navigation and wayfinding. With 65,000+ pages in the website, it was critical to get this right. Two rounds of usability testing, one with mid-fidelity wireframes and one with refined visuals. Findings from each round were reported and used as a basis for re-iteration of components and templates. We used Webpack, Sass, Handlebars & TypeScript to create a component-based architecture that would enable the Australian Museum to be flexible in their implementation. The project was documented using KSS notation and a heavily customised version of the SC5 styleguide generation tool to create a living component library. 28 usability testing sessions were conducted, across 8 different user types. 120 unique components were created, to cater for the 65,000 pages the live site will contain. These components are responsive across all viewports. 5 different navigation patterns were explored, in our quest to create an easily navigatable 5-level deep navigation system - with some levels containing over 200 pages. 412 Jira tickets were completed. 25 unique templates were created. We created an online interactive functional (technical) documentation to support website maintenance and the CMS integration project. We used a highly iterative approach, whereby each component began as a couple of words, and progressed in fidelity. this allowed us to simultaneously focus on page narrative and component re-use. With such a complex IA to rationalise, several different approaches were considered in our solution. With an increasing amount of asset digitisation by the library, a higher focus on digital services was needed. An updated website was required with a revised messaging architecture and content re-prioritisation. The University of Sydney Library were looking to reflect their progressive transformation in the library's refreshed online presence. Our testing clearly revealed users preferred a familiar and easy-to-learn, discovery style interface. as a typical user relies heavily on "search" to find many types of content. Using the Squiz matrix CMS can be complicated and time consuming for both new and existing users. Understanding how to navigate the interface, use the CMS features and efficiently updating page content can often overwhelm users and slow down the process of content authoring. Boomworks was engaed to build a Virtual Training Assistant (ViTA) and provide the Department of Education (DoE) staff with a method to quickly ask questions and get immediate answers within the context of content management inside the platform. The project was kicked off by synthesising an export of DoE's Squiz Matrix knowledge base, detailing a list of common questions that users typically ask. This formed the foundation for what responses ViTA would need be able to assist users with. Through an analysis of the type of responses that would be required, we visualised examples of conversational designs patterns (show screenshots of this) which included some intial sample dialogue flows. A workshop was also held to identify the personality of the bot, which is key to articulation of ViTA's responses. DoE created responses to the core questions in conjunction with Boomworks' content guidelines and conversational design process. This included detailing best practice for response content design with regard to messsage lengths, response visualisation using UI components, appropriate on-boarding and graceful fail flows. This phase ended with an untrained ViTA. Boomworks completed the first round of foundational training which produced a beta of ViTA that was then ready for further internal training by DoE. Further training of ViTA was conducted by DoE asking the virtual assistant an unlimited amount of permutations for the core questions. The most important aspect of this process is that it captures the multitiude of ways in which a core question could be asked. DoE integrated ViTA within SquizMatrix and ZenDesk while Boomworks closely monitored the interactions during the launch week. As part of our support agreement, ViTA was tuned and re-trained on a weekly basis after observing user interactions. This provided insights to DoE where further content, summarised or expanded answers were required to enhance usability and provide pathways for product enhancements. Sydney Opera House has an extremely popular website with online ticket sales being critical to their business. However, this was only partially responsive, not accessible and search capabilities on the site were limited. They were struggling with website maintenance on an aging platform. Boomworks was engaged to be their technical partner for upgrades and design, creating solutions that had a minimal impact to their ticketing system and user traffic.